I want children to learn that they can do anything great. 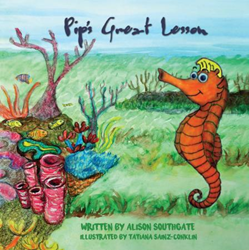 Within the pages of Alison Southgate’s new book, Pip's Great Lesson, ($9.99, paperback, 9781498471596; $20.99, hardcover, 9781498471602) young readers will meet Pip, a small seahorse with a very big heart. At home on the coral reef and friends with several fish, a sea cucumber, some crabs and lots of other creatures, Pip watches over everyone and tries his best to be a good friend. But one day, Pip realizes something very important about himself, and he learns a GREAT lesson. This engaging story empowers and uplifts children by providing a positive, self-affirming message – a message that today's children need to hear. It encourages children to let nothing hold them back - not size, physical, emotional setbacks or anything else. Alison Southgate has always loved marine life and holds an honors undergraduate degree in Zoology. She snorkeled on many reefs around the world including the Great Barrier Reef in Australia. Her astute knowledge about life in the reef has come from those experiences. As a teacher, she believes that empowering children from an early age is crucial to their development of self worth and good self esteem. As a mother of two young children, she sees the great value of training them to know their strengths and use their talents for the good of others. Xulon Press, a division of Salem Media Group, is the world’s largest Christian self-publisher, with more than 15,000 titles published to date. Retailers may order Pip's Great Lesson through Ingram Book Company and/or Spring Arbor Book Distributors. The book is available online through xulonpress.com/bookstore, amazon.com, and barnesandnoble.com.